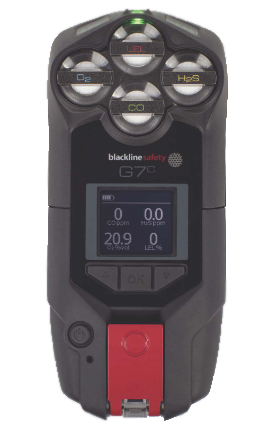 The Blackline G7 is available in a 1-4 gas diffusion unit with an internal pump/cartridge combination coming in a couple of months. This unit, like the Impact Pro, has a sensor cartridge system, but with single (1), dual (2), third (3) and maximum quad (4) gas options in configurations of O2, LEL, CO, H2S, NO2, SO2, NH3, etc; easily interchangeable in the field. Since the G7 sensor cartridge is both interchangeable and/or removable, the unit maintains its identical control, display and GPS abilities and may be utilized as a Tracking System only for use during travel to and from the client site of operation. The G7 is breaki ng new ground by adding Operator Tracking, Real Time Remote Third Party and/or in-house monitoring with Direct Two Way Voice Communications and on-the-spot reporting (see attached POR Reports) to customer protocol designated personnel via land line, cellular, text, email and/or other communication methods. The G7 has Trip and Fall/Man Down Alerts, ongoing and event alarms, maintenance issues, data logging, check in, and SOS Pull Station Emergency status. The G7 Auto Cal/Bump station is unique as it does not require purchasing separate cradles when switching from single to quad gas service applications. All options come with Auto Cal/Bump stations and built-in pumping systems that are powered by the unit itself; therefore, there is no need to purchase and inventory pump additions requiring extra chargers and battery packs. This internal pump feature eliminates human error during calibration/bump procedures that checks pump functionally and battery status and replaces the necessity of carrying both a separately powered detector and pump unit to site, which may or may not be available together at the time of need by the operator. No longer do supervisors have to wait for a maintenance report by returning the detector to a stationary docking station toggled to an out of province manufacturer service location. No longer do you have to register for courses on extracting and interpreting data, functionality of software, advanced classes on reporting, event management, administrative tasks to help you create a safety program an/or guidance through steps to create custom reports. With the EnviroMed G7 Gas Detection Monitoring Program, training is eliminated with pre-designed reports and event evaluation completed and sent directly to designate persons within minutes of the occurrence. If this training is what your gas detection provider is offering, than you really need to consider eliminating antiquated “Fill In The Blanks Safety Programs” and introduce a Safety Program based on automatically generated REAL TIME data reports that provide you with not only the most helpful information, but actual on the spot involvement via communication methods of your choosing. Your leadership and contact with the person or group experiencing a traumatic event will assist in directing a resolution, rescue protocol if necessary and the success of your Response Team to the event being monitored. With the EnviroMed locally serviced & supported wireless real time monitoring system, sensor deterioration and other unit shortfalls are relayed in real time through the customer’s choice of media & with established protocol to its operators & supervisors for appropriate recall and the avoidance of false alarms creating unnecessary downtime expense in operations. The EnviroMed G7 Gas Detection Tracking & Monitoring Safety Program may not cover all the bases of your situation, but from my 35+ years of using, servicing and promoting SAFETY in gas detection applications it sure “HITS A GRAND SLAM HOME RUN”!